The eGo 1100mA CE4 Clearomizer kit is a longer lasting, rechargeable, easily refillable starter kit - A great step up from smaller cigarette sized devices. Get almost twice the battery life compared to the 650 battery. Comes with two complete units and carry case. This device outperforms the smaller e-cigs considerably, it will not disappoint you! The CE4 Clearomizer in this kit holds 1.6ml of e-liquid to keep you going for a long time on one fill. Its nicely shaped drip tip screws on to seal, making it leak and spill resistant. It is very easy to fill, by just unscrewing the tip, tilting and dripping e-liquid into the side (try not to get liquid in the center, that is for air flow). No need for syringes with this kit! To change the coil, make sure your clearomizer is empty, unscrew the base, unscrew the used coil and screw in a new coil. 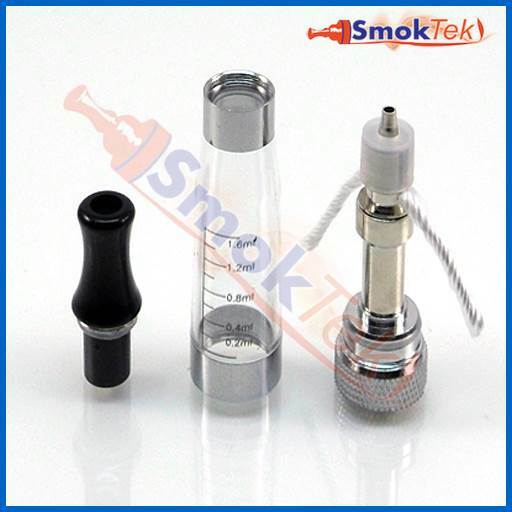 Follow the directions above to fill your clearomizer, and then screw the base back on. When using a fresh coil, set aside the clearomizer for a few moments to allow the e-liquid to properly saturate the new coil to prevent burning it. Click on the links here for extra clearomizers: the iClear 16 and T-Dux 3.0 are easy to use and look great on the battery included in this kit! The battery can be charged with the included eGo 420ma USB Charger. To charge, simply screw the battery onto the USB charger and plug into a USB port (or, if using with the included Wall Adapter, plug into a wall outlet.) The LED light on the charger will turn from RED to GREEN once the battery is fully charged. NEVER use cell phone chargers/adapters with the battery - it may cause an explosion or fire. Never leave battery charging unattended. Remove from charger once the battery is fully charged to prevent any damage. Be sure to add a bottle of your favorite e-liquid so you can refill many times! If you're new to "Vaping", this is a great starter kit! It offer ease of use, easy upgrades and easy mods. I'm now an ex-smoker with a healthy respect for what vaping has to offer. Enjoy!!! this thing is great. I like it haven't smoked in over a month. I did break a clearomizer by dropping it on the concrete. I wish I wound have known to buy more ce4 clearomizers. you are supposed to replace them about once a month. great product. Bought this kit, been using for 2 weeks, battery life is AMAZING so they're not lying when they say they will last all day. I switch between the 2, haven't needed to use the extra coils yet but did order extra clearos/coils as I am smoke free and all vape since I received this baby.. Carrying kit is awesome too - ORDER IT! Q: What coils do I order with this e-cig? Thank you for reaching out to us! 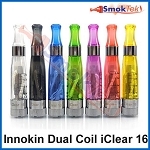 The SmokTek eGo 1100 CE4 Clearomizer E-Cigarette Kit with carry case comes with disposable clearomizers, so there are not replacement coils for them; however, the Innokin iClear 16 DC Clearomizer (link below) works great with these batteries, and they do have replaceable coil heads.